Atlanta still has three regular-season games to play, but for the first time in a long time, the Harlequins are sitting atop the Women’s Premier League (WPL) Red Conference standings. The team entered last weekend in second place behind Beantown, which traveled south for the 43-12 result. Atlanta head coach Kitt Ruiz credited the defense – an area of focus – for setting up the win. Chukwueke isn’t the first back to work into the forwards. During the previous round, backs captain Mo Compito flanked as well. Chukwueke worked alongside No. 8 Darian Lovelace, whose defensive output and try-saving tackles also drew praise, and flanker Naiomi Cayo-Nelson. Atlanta, which was celebrating its alumni weekend, took a 17-point lead into the break, as Chukwueke scored two tries and Tayler VanHoosier-McNeill added a third. Corinne Heavner slotted the conversion. All three players from Georgia Tech, Life University and Penn State, respectively, are 24 and younger. “It’s great to have the influx of fresh, young players … and it shows us how much college rugby influences the women’s game,” Ruiz reiterated. 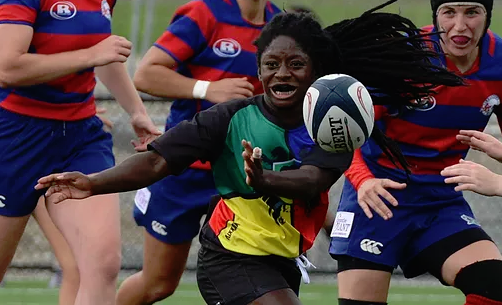 There was an adjustment period after halftime, as Beantown put in two tries (Kelli Smith, Emily Jones) during the third quarter, drawing the scoreline to 22-10 for a few minutes. But Atlanta was able to reset and dot down another four tries from Compito, Laketa Sutton and UCF’s Cortney Kuehl and Julia Phillips. Heavner added the extras in the 31-point victory. Beantown is 3-1-1 but only has two bonus points, to Atlanta’s four, and they were influential in the standings this week. Atlanta still has a very tough road ahead, and that’s the whole point of the WPL. The Harlequins play back-to-back road games in New York (which had the bye last weekend) then Twin Cities, before ending with D.C. at home. In reality, four teams have excellent chances of finishing top-two and competing in the national semifinals. “We have 27 players who want to travel to New York – which is a new thing for us and just amazing. Everyone is vying for positions and that just makes everyone better,” the coach added.